If any sound represents the sonic signature of contemporary ‘action’ cinema, it is that of epic percussion. Fortunately, we are not short of suitable contenders and, over recent years, these have included the ‘Thunder’ series of sample libraries from Strezov Sampling. 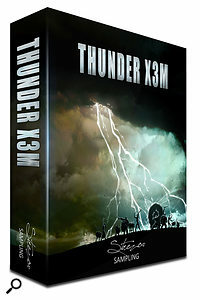 Thunder X3M brings together the samples from their previous three Thunder libraries, adds some 6GB of new sample content (the library runs to around 20GB once unzipped) and, perhaps most interestingly, adds a new Kontakt front-end (the full version of Kontakt 5 or later is required) to allow users to fully exploit the sounds. The sampled instruments are divided into a number of groups with Low Ensembles, High Ensembles, Ethnic Ensembles, Solo Percussion, Epic Metals and Sound Design Percussion. These run the range from meaty concert basses, low taikos and timpani, through toms, snares and tupans, past bendir and cajons and then on into all sorts of interesting non-traditional sounds. Each group contains multiple individual patches to choose between and, with ensemble and solo sounds, there is plenty of flexibility. The sampling for each instrument includes up to 10 velocity layers and multiple round-robin samples. Rolls are also included. While the raw samples sound fabulous, I think you would have a right to expect that in a library of this price, and there are plenty of other drum/percussion libraries that offer similar types of sounds. However, what might appeal to some potential purchasers is the features and flexibility of the front-end. Essentially, the main Kontakt patch starts with 12 empty zones mapped across the keyboard and users can build custom sound sets by loading individual sounds into any of these 12 zones. You can, therefore, build your own sound sets from within the library to suit the needs of a particular project. What’s more, only those samples required are loaded; Thunder X3M is therefore pretty friendly in terms of RAM demands. For the lazy, there are a small number of pre-configured patches you can load to experiment with. The front-end also allows you to blend three different microphone positions (Close, Decca and Hall) to control the ambience as well as add in Bass and Compressed (essentially parallel compression) elements for even more impact. All these controls operate at both a global level and independently for each of the 12 zones. In addition, you get Pitch, Attack and Sustain controls for each zone as well as three-band EQ; in short, with tonal, pitch, envelope and ambience options, you really can craft a massive range of sounds from what is a substantial sample base in the first place. Thankfully, the end results sound great. There are perhaps drum/percussion libraries out there that offer a more hi-tech feature set (pattern sequencing or modulation options, for example) but, with an impressive sound base, plenty of sound-shaping options, and a very user-friendly design for building your own patches, Thunder X3M will undoubtedly find a happy home with many working composers.